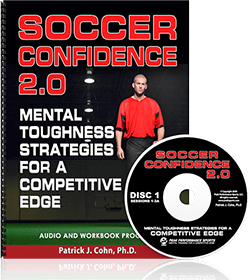 Today, we are excited to announce the upcoming release of a new CD and Workbook program specifically designed for soccer players and coaches. Our brand new CD program will be available in about two weeks and we’d like your help! We don’t want to leave any stone unturned… We’d like to know your (or your players’) top challenges with confidence in soccer. For Players: What’s your number one challenge with performing with confidence in games? For Coaches and Parents: What’s your number one question on how to help your players perform with confidence? Please post your response below under Speak Your Mind. P.S. 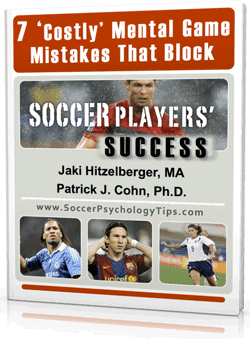 We are committed to creating the best mental training program for soccer players. Please let us know how we can help you have more confidence in practice and games! Leave your comments below under Speak Your Mind. Player: How do I keep my confidence after making several mistakes in a row? Coach: How can I help my team have high confidence when we’re playing a team we’ve lost to? Parent: What can I say to my son after a loss to help him stay confident? I find my son play with an exorbitant amount of more confidence in the last game of any tournament than he does in the first 1-2 games. He tends to play “safe” early on. When he unleashes himself he plays so much better. How can we get him to play in the first games like he does in the latter games? Thanks for your questions. This isn’t all that uncommon. Players tend to be more nervous at the beginning of tournaments and then loosen up and feel more confident once they play a game or two. Sometimes players who think they are playing in a “big” tournament, are worried about tough competition or wonder if they will play well. 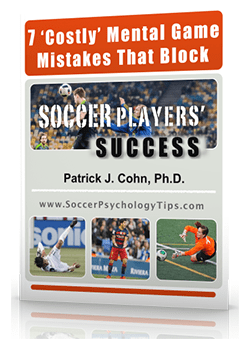 This tends to cause players to try and avoid making mistakes, which inevitably leads to a “safe” performance (as you mentioned). There’s a numbers of factors that might be preventing him from taking risks early on. From your perspective do you think he is intimidated by the competition, focused on impressing others, fearful of making mistakes, or maybe lacking confidence in his skills? One more important point: ENCOURAGE, encourage, encourage, 80% – 20% Correction! Goes a long way in assisting players in knowing you care about them! Great points on focusing more on the team than individual performances. When players share a common goal, great things happen. Referring back to Dave’s question, Do you have experience with players being more timid in the first game of tournaments (a number of my athletes say they are)? I work with my players on how to create a pregame routine to ensure they are feeling confident, focused, and ready to trust their skills. I encourage them to use the same routine, no matter how “big” or “important” the game is. I instruct them to treat every game the same and focus on the small things they or their team does well on the field and less about winning or scoring. Thanks again for your input Don, Cheers! I practice in an academy with players who are more experienced than I am because I haven’t been playing for very long. I lose confidence sometimes when I make a bad pass, lose the ball, etc, and especially when the player is more skillful than me. Also I am naturally not agressive, so I tend to not play hard and attack. Can you give me some tips to improve, especially with attacking?